Jason DeRouchie, ed., What the Old Testament Authors Really Cared About: A Survey of Jesus’ Bible (Grand Rapids: Kregel, 2013). 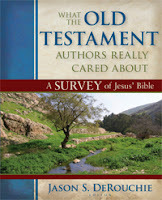 The Old Testament is unexplored territory for many Christians. So any resource that can help one to navigate through this part of Scripture should be appreciated. What the Old Testament Authors Really Cared About is just such a resource. This work, the product of seventeen authors and edited by Jason DeRouchie, is concise, well-written, and pedagogically friendly. The book is arranged in Jewish canonical order with each book covered individually. There are numerous and helpful charts, diagrams, sidebars, maps, and photos. The book contains seven appendices (although the last two are really more indices). There is not much to criticize in this work. It is certainly not as detailed as some other surveys but what it does it typically does well. One chapter that I did find disappointing was the one on the Twelve (i.e. the twelve Minor Prophets). While one can justify treating the Minor Prophets as a single book, I think it would have been better to address each book individually. After all it is called the Twelve and not the One. Furthermore, since this is a survey of Jesus’ Bible, it might be worth noting that the New Testament never clearly refers to the Twelve collectively, but rather to individual prophets/books (e.g., Joel [Acts 2:16], Hosea [Rom 9:25], Jonah [Matt 12:39, etc.]). But these criticisms do not outweigh the overall value of the book. Indeed, I wish that this book came with a CD or website access that would allow pastors and teachers to easily access the charts, diagrams, maps, and photos for presentation purposes. I am thankful to Kregel for providing the review copy utilized in this unbiased review. What Drives Your Preaching Schedule?